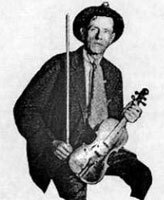 Chanteur et fiddler Country US né John Carson le 23 mars 1868 à Fannin County (Georgie). Fiddlin' John Carson est mort le 11 décembre 1949 à Atlanta (Georgie). Carson was born in Fannin County, Georgia, and grew up on a farm there. His father worked as a section foreman for the W&A Railroad Company. In his teens, Carson learned to play the fiddle, using an old Stradivari-copy violin brought from Ireland in the early 18th century. When he was eleven years old he used to roam the streets of Copperhill playing for tips. In his teens, he worked as a racehorse jockey. On April 1, 1913 Carson performed at the first annual "Georgia Old-Time Fiddlers' Convention", held at the Municipal Auditorium in Atlanta, where he only became fourth. But between 1914 and 1922 he was proclaimed "Champion Fiddler of Georgia" seven times. The governor of Tennessee, Robert L. Taylor dubbed him "Fiddlin' John". In 1919, Carson began touring, mostly the areas north of Atlanta, with his newly formed band the Cronies. He became associated with many politicians of Georgia, like Tom Watson, Herman Talmadge and Eugene Talmadge, relations that gave rise to new songs like "Tom Watson Special". Carson and his daughter Rosa Lee began a series of performances for different political campaigns: for the Tom Watson U.S. Senate Campaign in 1920, for all of the Gene Talmadge's campaigns, and for the Herman Talmadge governor campaign. On September 9, 1922, Carson made his radio debut at Atlanta Journal's radio station WSB in Atlanta, It was reported by the Atlanta Journal that Carson's fame quickly spread all over the United States following his broadcast at WSB. In early June 1923, Polk C. Brockman, an Atlanta furniture store owner, who had been instrumental in the distribution of records for Okeh, went to New York to work out a new business deal with Okeh Records. Later, in New York, he was asked if he knew of any artist in Atlanta that could justify a recording trip to Georgia. Brockman promised to return with an answer. A few days later, he was watching a movie followed by a silent newsreel at the Palace Theater in Times Square. The newsreel contained footage of Fiddlin' John Carson from an old time fiddler's contest in Virginia. 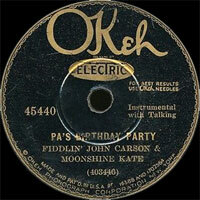 Brockman wrote in his notebook: "Record Fiddlin' John Carson". At his next meeting with Okeh Records Board, he persuaded Ralph Peer to go ahead and record Carson. About June 14, 1923 (date is uncertain), Carson made his recording debut in an empty building on Nassau Street in Atlanta, cutting two sides, "The Little Old Log Cabin In The Lane" and "The Old Hen Cackled and the Rooster's going to Crow." Peer didn't like the singing style of Carson and described it "pluperfect awful" but he was persuaded by Brockman to press five hundred for him to distribute. 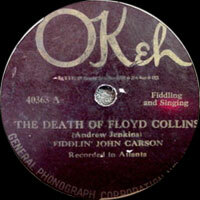 The recording was immediately sold out from the stage of the next Fiddler's convention on July 13, 1923. Peer, realizing Carson's potential, immediately invited Carson to New York for another recording session. 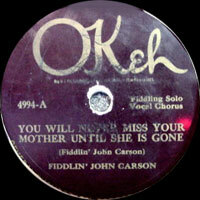 Fiddlin' John Carson ceased recording temporarily in 1931 but resumed in 1934, now for the Victor label. 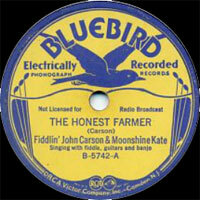 Between 1923 and 1931, Carson recorded almost 150 songs, mostly together with the "Virginia Reelers" or his daughter Rosa Lee Carson, who performed with him as "Moonshine Kate". He wrote more than 150 songs in his life but only nine were ever copyrighted. Because Carson couldn't read sheet music he had his songs transferred to standard notation by the stepdaughter of preacher Andrew Jenkins, Irene Spain. Carson was involved in several copyright issues with both Okeh Records and other musicians during his active career. In his later years, he worked for the local government as an elevator operator in Atlanta, a job he had obtained through his friendship with governor Herman Talmadge. He died in 1949 in Atlanta, Georgia, and is buried in Sylvester Cemetery in the East Atlanta neighborhood of Atlanta. 01/1998 CD DOCUMENT 8014 (UK) COMPLETE RECORDER WORKS IN CHROLOGICAL ORDER - VOLUME 1 - C. 14 JUNE 1923 TO APRIL 1924 - The Little Old Log Cabin In The Lane / The Old Hen Cackled And The Rooster's Gonna Crow / When You And I Were Young, Maggie / You'll Never Miss Your Mother Until She's Gone / Be Kind To A Man When He's Down / Billy In The Low Ground / Casey Jones / Old Sallie Goodman / Fare You Well Old Joe Clark / The Farmer Is The Man That Feeds Them All / Papa's Billy Goat / The Kickin' Mule / Nancy Rowland / Tom Watson Special / Old And In The Way / Dixie Boll Weevil / When Abraham And Isaac Rushed The Can / The Cat Came Back / I Got Mine / Dixie Cowboy / John Henry Blues / Arkansas Traveler / Old Aunt Peggy, Won't You Set 'Em Up Again? 03/0998 CD DOCUMENT 8018 (UK) COMPLETE RECORDER WORKS IN CHROLOGICAL ORDER - VOLUME V - 11 OCTOBER 1927 TO 17 DECEMBER 1929 - The Little Log Cabin By The Stream / Christmas Time Will Soon Be Over / Run Along Home, Sandy / Moonshine Kate / John Makes Good Licker / I'm Going To Take The Train To Charlotte / Ain't No Bugs On Me / The Burglar And The Old Maid / The Hawk And The Buzzard / Down South Where The Sugar Cane Grows / Meet Her When The Sun Goes Down / My Ford Sedan / You Can't Get Milk From A Cow Named Ben / Going To The Country Fair / Welcome To The Travelers Home No. 2 / You'll Never Miss Your Mother Until She's Gone No. 2 / John Makes Good Liquor, Pt. 3 / John Makes Good Liquor, Pt. 4 / She's More Like Her Mother Every Day / Times Are Not Like They Used To Be / Pa's Birthday / Corn Licker & Barbecue, Pt. 1 / Corn Licker & Barbecue, Pt. 2 / Who's The Best Fiddler?